I don’t know of a better way to get to know teens, or anyone for that matter, than to play a game with them. People are most themselves when playing a game because they let their guard down and show how competitive or silly they can be. It’s for this reason that I was super (see what I did?) 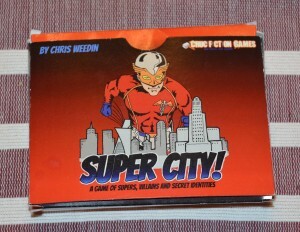 stoked to be contacted by Crucifiction Games to give their new game Super City a look. Chris Weedin, CEO of Crucifiction Games, sent me a demo of Super City, ahead of their Kickstarter, to get my impressions of this game for youth groups. Chris is himself a believer and lover of youth ministry and I hope to have him on the YMIM podcast soon so he can tell his story behind Crucifiction Games. I am happy to say that this game looks really cool and I think Youth Pastors will love playing this game with their kids. This post is not a review of the game but a quick overview of the game, a break down of the cards, and game mechanics. Note: All cards are demos. The actual cards in the starter pack will look different. The game comes in the box you see below with a total of 62 cards. 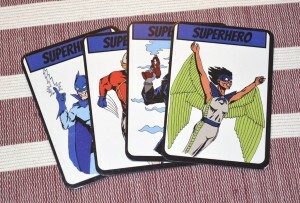 The cards are broken down into Sidekicks, Super Heroes, Super Villains, and Citizens. This game is a mash up of the game One Night Ultimate Werewolf: Day Break, The Resistance, and Mafia. In all of these games you are trying to guess who is who and eliminate the “right people”. In Super City you are trying to keep your own identity secret while trying to eliminate everyone else, depending on who you are. The cards are dealt out by the Narrator who keeps the game moving and all identities are secret until someone is eliminated. Each character has certain victory conditions. 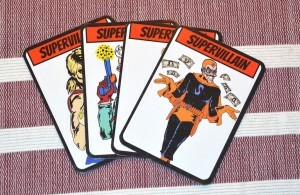 If you are A Super Villain, you want to eliminate Sidekicks, Super Heroes, and Citizens. Everyone else tries to eliminate Super Villains. 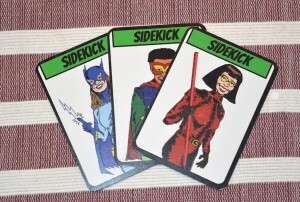 In round one, Sidekicks lift their heads and choose to protect one citizen, at least they hope it’s a citizen and not a super villain, from elimination. Round Two belongs to the Super Villains, they raise their heads, while everyone has their head down, they will choose a citizen to be eliminated. 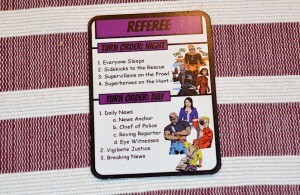 Round three belongs to the Super Heroes, they run down clues in their super tights and choose a person and the referee will tell them, silently, whether that person is a super villain or not. The first three rounds represent the Night and now comes the day. The Day is kicked off with the the Daily New Report. The narrator takes on a bit of role play and shares what happens during the Night. “This just in, the villain known as Toe Jam broke into a Foot Locker and stole 100 pairs of socks. A night watchman tried to run him over but his vehicle was was Toe-tled in the process.” The is one of the narrator’s j0bs but the role of the news anchor is taken over by others as they are eliminated. I like this aspect of the game because no one is truly “out” of the game forced to watch others play. The next to last round is Vigilante Justice. Someone’s gotta pay for all those socks. 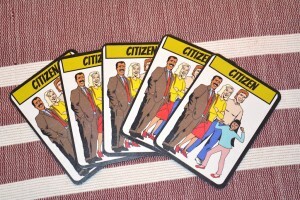 The citizens that remain in the game must accuse someone of being the super villain. Someone accuses, someone seconds the accusation, arguments from the accuser and the accused ensue (about 30 seconds each) and all in good fun, the narrator/storyteller then counts to three and on three everyone votes thumbs up or down on the accused. If the majority wins, the accused is eliminated. If the votes are not there, the accused survives another day. In all, two people are voted out every “day” (unless a sidekick has saved someone) which makes the game go fast. Finally, it’s Breaking News. 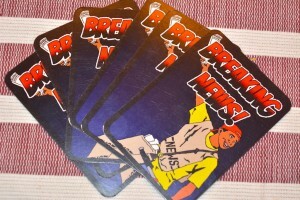 Breaking news cards are fun cards that get people moving and doing but have the potential to be game changers. Breaking News cards are like commercials in the game that allow for a little fun. If you happen to be the Paper Boy you have the power to choose the next headline. Super City can be played with as many as 25 people; which is great because a small to mid-sized youth group could play this all together if they wanted to. This is just the basic game. There are variant character cards with writing on them that can change game play dramatically but they are probably best used in larger groups unless you want to play super quick games. I look forward to testing this with my group and will probably put up some live game play on on YouTube Channel. This is only my first impressions but I think Super City will have our kids begging to put on their capes and play this game over and over again. Check out the Kickstarter and maybe you could be part of the game, literally. Fabulous coverage, Paul! Thanks so much. I’ll even forgive the overzealous and even painful use of the “super” pun in the opener. I’ve fallen victim to the same trap. 🙂 Thanks again… you’re SUPER!